JOHN BERNARD vs. NANTUCKET BOY'S CLUB, INC. Plaintiff, a resident of Nantucket, brought this complaint against defendant, a Massachusetts charitable corporation with a clubhouse on Sparks Avenue, Nantucket, seeking to have the court impose a constructive trust upon a certain lot of land (hereinafter locus) shown on Appendix A [Note 1] attached hereto and a reconveyance of the same alleging that the defendants wrongfully and fraudulently included the locus as part of a larger parcel (hereinafter called "tract") registered to the defendant in Land Court Case No. 38541. Defendant Boy's Club answered denying the allegation of the plaintiff, alleging that the action is barred by the statute oflimitations and that the plaintiff is guilty of laches. The Attorney General appeared and took part in the matter although he filed noanswer. After various preliminary motions, the case was heard on December 1, 1981 in Boston, on December 3 and 4 in Nantucket, and on December 15, 17 and 21, 1981 in Boston. A stenographer was sworn to record and transcribe the testimony. On December 2, 1981 a view of the premises was taken in Nantucket with attorneys present. Upon receipt of the transcripts, the defendant, through its attorney, filed a motion to correct the same. Two hearings were held on this motion, the last one being on May 21, 1982. Briefs were filed by the parties hereto on June 9, 1982 for plaintiff and June 10, 1982 for defendant. Twenty witnesses testified at the trial and two witnesses (one of whom testified at the trial) testified upon the motion to correct the transcript. Eighty-four exhibits, plus a chalk were introduced into evidence and are incorporated herein for the purposes of any appeal. Plaintiff claims there was a wrongful and fraudulent registration of the locus as part of the tract, without notice to plaintiff who claims to have been the rightful owner of the locus at the time of the registration, under the doctrines set forth in the cases of State Street Bank and Trust Co. v. Beale, 353 Mass. 103 (1967) (hereinafter State Street), and Kozdras v. Land Vest, Mass. (1980) [Note 2] (hereinafter Kozdras). G. L. c. 185, §28 provides that a petition for registration shall state the names and addresses of the adjoining owners and occupants. G. L. c. 185, §38 provides for publication of notice of the filing of the petition directed to among others "adjoining owners and occupants" as well as to "all whom it may" concern." Finally, under G. L. c. 185, §39 the Court is directed to send a copy of the newspaper notice by registered mail to every person named therein. The petition for registration in Land Court Case 38541 was filed on September 10, 1974 and a decree issued thereon on January 9, 1976. The plaintiff was not named as an adjoining owner therein and received no notice by registered mail. Whether or not he should have received notice would depend upon his being an "owner or occupant" of an adjoining parcel on September 10, 1974. There is no claim made by the plaintiff to occupancy. Rather, the plaintiff claims that he was the owner of locus on this date. Whether or not plaintiff had title to the locus upon registration depends upon what was included in a deed from Maude Adams to defendant, (Exhibit 31,) dated November 21, 1957 recorded in Book 117, Page 403. [Note 3] If this deed included the locus, then plaintiff had no title and no reason to be notified of the Land Court registration in Land Court Case No. 38541. I. What did the Maude Adams deed of November 21, 1957 convey? SOUTHERLY: by land of John J. Walsh, et ux. NORTHERLY: by land of said Morris. Said property being entirely enclosed by fences. For my Title see Estates of Marcia Adams and Edgar Adams probated in Nantucket Probate Court." "When a deed contains two inconsistent descriptions of a parcel of land, the more specific will govern. In the absence of evidence in the deed of a different intention, the descending order of priority is: monuments (including neighboring land of someone other than the grantor), courses and bearings in a running description, distances and area." See also Ryan v. Stavros, supra and Temple v. Benson, 213 Mass. 128 (1912). The Court heard testimony from plaintiffs' title examiner, Mr. Reede, who used some very well drawn chalks from which to testify. In addition, both plaintiff and defendant presented contradictory title opinions from their expert witnesses. The key to the whole matter is the "Maude Adams" deed (Ex. 31) which makes reference to "other land of grantor", and to a provision "Said property being entirely enclosed by fences." Both are monuments and they may be inconsistent. There is agreement that on November 21, 1957, Maude Adams owned the so called "tract" of land including locus as shown on Appendix A. The title reference in the above deed is incorrect, however. Maude Adams conveyed the area marked locus on Appendix A to John J. Walsh et ux by deed dated September 14, 1955, recorded in Book 116, Page 37 (Exhibit 26). The same John J. Walsh et ux reconveyed the same premises to Maude Adams on October 24, 1955, by deed recorded in Book 116, Page 113 (Exhibit 28A). This should have appeared in the title reference in the Maude Adams Deed (Exhibit 31) together with the estates of Marcia and Edgar Adams. The Land Court Examiner in his abstract in Land Court Case No. 38531 did not show these Walsh conveyances and evidently the drafter of the Maude Adams deed did not pick them up either, which may be the reason for the incorrect title reference. In the view the Court takes this is of no consequence. The fourth call in the Maude Adams deed reads "Northerly by other land of grantor." The plaintiff argues that Maude Adams meant to and did retain locus when she deeded to the Boy's Club as this was the only way the line could run by her, grantor's, land. The land to the north of locus, shown in a deed from Adams to Potter, (Exhibit 32), had been owned by Maude Adams' father until sometime in the 1920's. All agree that it was not owned by Maude in November, 1957, but rather by Edward S. Hickey, et al. The fifth call in the deed "Easterly: by land of Manuel Morris" would likewise appear to leave room for doubt. It would appear that this line should have read "Westerly by land of Hickey," for the Morris land was to the north as called for in the last call in this deed. Thus, there is doubt as to this "other land of grantor" and as to the easterly line by Morris. As against these doubtful references is the provision that the property was "entirely enclosed by fences." The drafter of this deed specifically set forth that it was "entirely" enclosed. There was conflicting evidence as to there being a fence dividing locus from the tract as shown on Appendix A. Two witnesses testified recalling a fence of some sort. Contradictorily, there were witnesss who testified to playing on the tract as boys and testimony from a later executive director of the Boy's Club and from others that there were no fences between the locus and tract. The surveyor, Mr. Shugrue, found evidence of a fence dividing the "tract" from land of Hickey as shown on Appendix A. The Court on its view saw the remains of fence posts in this area, also shown on the photograph, Exhibit 82. There was no evidence of a fence dividing locus from tract along either the southeasterly or northeasterly lines of locus as shown on Appendix A. An aerial photograph, (Exhibit 62), taken in 1938 and a second aerial photograph introduced by plaintiff (Exhibit 63) taken in 1940 showed fences surrounding the tract but not dividing the locus from the tract, according to testimony of a photogrammetric expert, Eugene Coe. Of particular significance to the court, was still another aerial photograph, (Exhibit 65), taken on November 12, 1957, just ten days before the date of the Maude Adams deed. A blowup of this photograph was introduced into evidence as Exhibit 82. The court does not need a photogrammetric expert to point out the fence on the blown up aerial photograph as it is clearly visible surrounding the tract. 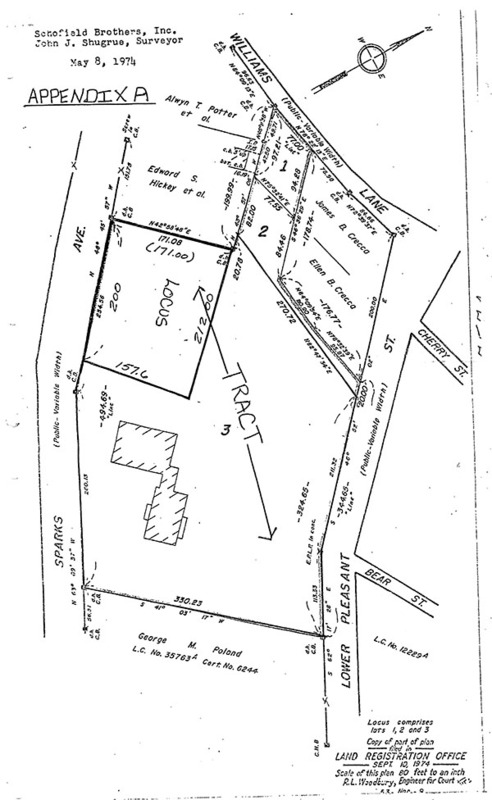 There is no evidence of a fence dividing the locus from the tract shown on this photograph The Court finds that a fence enclosed the whole of the tract in November, 1957 and that there was no fence dividing the locus from the tract. The title standard set forth above states that where there are two inconsistent descriptions, the more specific will govern. Certainly, the more specific monument, the fence, was clearly there 10 days before the date of the deed. The court thus rules that the MaudeAdams deed conveyed the tract, including the locus, to the Boy's Club on November 21, 1957. II. Is this matter governed by the case of Kozdras v. Land Vest and State Street Bank and Trust Co. v. Beale? In the case of State Street Bank and Trust Company v. Beale, 353 Mass. 103 (1967) a petitioner registered a parcel of landknowing of the ownership or claim of ownership of this parcel by another, asserting in the petition that he knew of no person other than petitioner having an estate or interest in the parcel. Consequently, the owner or the claimant to ownership received no notice by registered mail, although there was publication. Two affidavits were filed by petitioners. One affidavit was filed by the chief assessor of a Town asserting that the petitioner had been assessed for the parcel in question (25 acres) for twenty-five years, whereas the assessors' records showed the assessment was only for a 5 acre parcel. This assessor was familiar with the facts and the court found that he made the affidavit with intent to defraud or with such willful disregard of the facts to amount to fraud. The second affidavit recited information that the maker of the affidavits either had no knowledge of, or knew to be false, and this was filed with the court by the petitioner with the intention of deceiving the court. Thus, State Street involved actual fraud and the fraudulent registration of a parcel of land not the plaintiffs', and known to the plaintiff to belong to somebody else. The case of Kozdras v. Land Vest Properties, Inc., supra, enlarges on the State Street case as the trial court found no intentional wrongdoing and no fraud as such, but did find "technical and/or constructive fraud." This consisted of a claim to ownership of 12 acres of land shown on assessor's plans to be that of Kozdras whereas the petitioner's file plan showed it as belonging to petitioner. An assessor's certificate which included an untrue sketch of petitioner's land was likewise filed. The Supreme Judicial Court concluded that the registrant Land Vest "had actual knowledge of a discrepancy between the assessor's plan and the plan filed by them and hence disregarded facts susceptible of actual knowledge. Thus, the plan filed by (Land Vest) was false. Such willful disregard of the actual facts is fraud." Kozdras, supra at 2418. There is one enormous difference between the case at bar and the State Street and Kozdras cases. In these two cases title was in other persons than the registrant. In the case at bar this Court has ruled that the title to the locus was in the Boy's Club by the Maude Adams deed of 1957. The petition for registration in Land Court Case No. 38541 (Exhibit 81) was signed by the Nantucket Boy's Club, Inc. by Harold W. Lindley, President, on September 9, 1974, and acknowledged on the same date by him before Robert F. Mooney, Notary Public. The description contained therein described the tract, including locus, as shown on a plan of Schofield Brothers (Exhibit 60). It, together with the plan, was filed on September 10, 1974 with the Land Court by Robert F. Mooney, Attorney for the Boy's Club. Paragraph 3 of the petition contained petitioner's statement that it knew of "no mortgage or encumbrance affecting said land or that any person has any estate or interest therein, legal or equitable, in possession, remainder, revision, or expectancy..." Accompanying the petition and plan on their filing was an Assessors' Certificate (Exhibit 61) which listed as abutters of the tract, Edward S. and Eleanor G. Hurley, to the southwest and Alexander M. Craig, Jr. to the northeast. On September 12, 1974 title reference was sent to C. George Anastos as Land Court Examiner together with the Assessor's Certificate (Exhibit 61) which had been signed and sealed by the three then assessors, Barbara L. Holdgate, Walter S. Bassett, and Cal S. Conwall on May 24, 1974. It is noteworthy that the said Barbara L. Holdgate and Walter S. Bassett signed and sealed the Assessor's Certificate once again on December 13, 1974. It is a fair inference that the said Anastos had given them this to sign once again. On December 19, 1974, the said C. George Anastos certified that he found no change in the names of the adjoining owners from those reported by the assessors from an examination in the Registry of Deeds since January 1st, 1974. The persons appearing as adjoining owners on the Assessor's Certificate were notified properly. Since the Court has ruled that the Maude Adams deed contained locus there was no reason to notify plaintiff as an adjoining owner. III. Assertion of impropriety by the plaintiff. The Court having found and ruled that the Maude Adams deed in 1957 conveyed the tract, including locus, to the Boy's Club and that as a result the plaintiff had no reason to get notice of the registration proceedings, the various assertions of improprieties made by the plaintiff are of no consequence. However, the Court will address some of them briefly. Plaintiff makes much of the assessor's records. That these records have left much to be desired has been common knowledge for many years and there was testimony to that effect in this case. The court would also refer to the court's remarks in the case of Hardy v. Jaeckle, 371 Mass. 573 (1976). Exhibit 51 is an abstract of the assessors records. In 1957 these show "Sparks Avenue (1 acre21,000 sq. f t.) 200" assessed to Maude Adams. From 1958 through 1963 the Nantucket Boy's Club was assessed for 1 1/2 acres on Sparks Avenue. From 1964 through 1975, the Nantucket Boy's Club was assessed for 2 1/4 acres on Sparks Avenue. Where the extra 3/4 of an acre comes from is unexplained. After the conveyance by Maude Adams in 1957, Exhibit 51 shows that the Sparks Avenue parcel formerly assessed to her disappeared and she was not assessed for it from 1958 through 1964. In 1965-1966, an item "Sparks Avenue (35,000 sq. f t.) 300" appears for the first time under Maude Adams' name. This was continued to be assessed to her in this manner through 1973. In 1974, this item "Sparks Ave. (35,000 sq. ft.) 300" appears under the plaintiff John Bernard's name and continued thus through June 30, 1976. From the evidence, the Court cannot explain the various assessments. It is only conjecture that the Boy's Club might have acquired other property to add to that obtained in 1957. Where the "Sparks Ave., 35,000 sq. ft" assessed to Maude Adams came from is unknown to the court. How and when it came to be transferred on the Assessor's records to plaintiff Bernard is not known. There was evidence that the assessors' plans were changed constantly with deletions being made and with additions penciled in throughout this whole period of time. Perhaps this explains it. At any rate, as has been seen in the previous paragraph, Exhibit 61 is the Assessor's Certificate filed with the Land Court together with the registration petition on September 10, 1974. It was signed and sealed by first three assessors on May 13, 1974 and again by two assessors on December 13, 1974. And, as recited above there is the statement reciting no changes in the adjoining owners signed by the title examiner, C. George Anastos, on December 19, 1974. The Court cannot find that the Assessor's Certificate, Exhibit 61 was issued by the assessors improperly. The assessors obviously considered it twice. The date when the records of the assessors were assembled for the year 1974 is unknown. It could have been done at a date after 1974 as additions and deletions were constantly being made. The Court finds that as of the filing of the petition on September 10, 1974, the property was assessed to the Boys Club. Inasmuch as the Court has found herein that the Maude Adams deed conveyed the whole of the tract, including locus, to the Boy's Club in 1957, there was no property left to be assessed to the plaintiff, John Bernard, in 1974 and the Court so finds and rules. Thus, there was no reason to notify him by registered mail or otherwise of this registration. It should be noted that from the date of the Maude Adams Deed on November 21, 1957, until the filing of the Land Court Petition in Land Court Case No. 38541 on September 9, 1974, much activity took place on the tract. The clubhouse was evidently finished by 1964 as it was assessed in 1965 to the Boy's Club. (Exhibit 51). This was not located on locus but to the southeast on the tract. (See Appendix A). The locus was used during construction for storage of materials and had been leveled in spots and filled in other spots. Maude Adams lived in the near vicinity as did plaintiff with her at least for most of the time. No objection appears to have been made by them or anybody else for that matter to the use of locus. The plaintiff has made various allegations of impropriety in the circumstance surrounding the registration process. One of these involves the conservatorship of Maude Adams. The plaintiff was a man with no steady job and with severe personal problems who resided for the most part with Maude in her home on Pleasant Street, sometimes under stormy circumstances due to his misconduct. During 1972, Maude was failing and on a petition signed by her and filed with the Nantucket Probate Court by her attorney, Wayne F.	Holmes, on August 22, 1972, the latter was appointed her conservator on September 14, 1972. The conservator's inventory, filed by the said Holmes on September 21, 1972 listed four items of real estate, including "Item 3, vacant lot, 1 ac.-Pleasant St. Nantucket -15,000" and "Item 4, vacant lot - 1 ac. -Sparks Ave., Nantucket, Mass. - 15,000". The conservator testified that he did not search the title but got his information about the real estate from the assessors. A petition for a license to sell, filed on October 5, 1972, listed Item 4 above as a parcel to be sold and a license was granted on November 16, 1972, but never used. Eventually, the conservator's first and final account was allowed on July 11, 1974. There was testimony from Mr. Holmes that Maude told him in the presence of plaintiff John Bernard that she had conveyed the Sparks Avenue property to the Boys Club. The Court finds no impropriety here and in any case the ruling as to the content of the 1957 Maude Adams deed makes it of no consequence. Another alleged impropriety involves the attorney Robert Mooney who represented the Boy's Club in the registration proceeding. The evidence showed that at various times Mooney and several other attorneys in Nantucket had represented the plaintiff, John Bernard in various matters. Maude Adams died on December 19, 1972. On January 5, 1973 a petition for the probate of her will was filed with the Nantucket Probate Court (Ex. 34). John Bernard was named executor. Robert Mooney filed an appearance as attorney for one Claramond Knight on February 9, 1973 and a petition for the appointment of a special administrator which was granted. The special administrator filed a petition for the sale of real estate on October 2, 1973 with Robert Mooney still representing him as counsel. The license to sell describing the locus was granted by the court but was never used. It was a year later that the petition for registration of the tract was filed with the Land Court with Mr. Mooney, an active member and leader of the Boy's Club, acting as its attorney. No title search was made by him before the filing. Again even if Mr. Mooney acted improperly, and the Court does not imply that he did, the fact remains that the Maude Adams deed had conveyed the tract to the Boys Club. Finally, there was a dispute as to the testimony of one Wayne Holmes who drafted a final will for Maude Adams which wasunsigned at her death. The reporter testified that the evidence was as reported by him and Wayne Holmes testified differently. In the view the Court has taken it makes no difference. To sum up, the Court finds and rules that the Maude Adams deed of 1957 included the locus as shown on Appendix A and orders the complaint dismissed. [Note 1] Appendix A is a copy of Exhibit 60, entitled "Plan of Land in Nantucket, John J. Shugrue, Surveyor, dated May 8, 1974" to which the Court has added certain annotations. [Note 2] Mass. App. Adv. Sh. (1980) 2409. [Note 3] All book and page references are to Nantucket County Registry of Deeds.